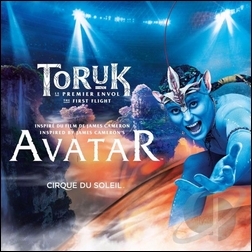 All About TORUK-The First Flight! Learn all about TORUK-The First Flight below! Lemieux and Pilon, who also wrote the show, sought to convey the awe-inspiring beauty and vital impetus of the world of Pandora – its rich textures, lush flora, and youthful buoyancy. The multimedia projections that evoke the awe-inspiring landscapes – from the Floating Mountains and the Omaticaya Hometree, to the Anurai’s animal sanctuary and the lush jungles where the Tawkami live – create a visually stunning environment for the performers. So do the large-scale effects that come from the storyline, such as the earthquake and volcano eruption, the rivers of lava rising from within, and the Shaman’s visions projected on a huge floating, ethereal veil. •There are 40 video projectors in all: half are 30,000-lumen each, the other half, 20,000-lumen. • video projectors are used for projections on the ground; 6 projectors send video images on Hometree; 2 projectors are dedicated to the two lateral screens; and 8 projectors are used for immersive projections into the audience. The Green Belt – The terrain on Pandora is neither smooth nor flat. To create a fragmented topography that evokes the uneven landforms on Pandora, the Set Designer created an elevated, padded bank – or Green Belt – all around the stage on which performers can climb and move around. The Green Belt ensures that images projected on the ground look more three-dimensional. It also doubles as a cover for the rink board. As Pandora is a world lush with vegetation, threedimensional retractable plants pop out of the Green Belt during scenes to evoke the forest environment. • The stage is 85 by 162 feet. The costumes should look like they were made by Na’vi hands, hence the organic, handmade look to the wardrobe. Textures and prints were designed to overcome the fact that there are no fabrics on Pandora. The artisans in the costume department sought out materials that potentially looked like they were naturally available to the Na’vi in their environment. The exotic fauna of Pandora is personified on stage through state-of-the-art puppetry. 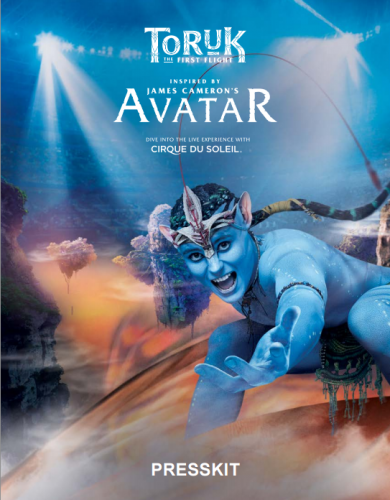 The challenge for the costume team was to determine how the puppeteers would manipulate the puppets without being identified as Na’vi, while remaining connected to the world of Pandora. To address this challenge, an all-black Na’vi costume was created. One of the biggest challenges during the creation of TORUK – The First Flight was to figure out how to portray the Na’vi in their “natural” environment in a credible way. Hence the idea of developing a different acrobatic language for this show. Each of the five clan in the show has features and skills that sets it apart from the others. To reflect this, the creative team assigned a distinct performance or movement signature to each clan. Omaticaya – Giant Loom & Vines: The giant loom that holds a special place in the everyday lives of the Omaticaya doubles as an apparatus. Artists climb up the structure and leap from one bar to the other, performing moves that borrow from various aerial acrobatic disciplines. Anurai – Thanator Sculpture: An apparatus that recalls the skeleton of a Thanator – Palulukan in the Na’vi language – was created for the noble Anurai. The artists climb on the structure and perform a balancing ritual in honor of the Thanator. Kekunan – Kites: The art of indoor kite flying is used to evoke a colony of Mountain Banshees during the scenes featuring the Kekunan, a clan that lives near the creatures’ breeding ground high up in the mountains. In certain scenes with Ralu, Entu and Tsyal, the kites become characters in their own right. Tipani – Poles and Staffs: Valiant warriors, the Tipani are deft at manipulating poles and staffs during symbolic or ritual battles. Tawkami – Pandoran Flora: As for the Tawkami, proficient botanists known for their vast knowledge of plants and their healing properties, the oversize flora of Pandora serves as a showcase for the clan’s special abilities. Searching for potent seeds, Tsyal climbs up the pistils of an enormous flower suspended from above and performs moves that have all the earmarks of an aerial silk act. During the Tawkami scene, members of the clan celebrate the harvest by performing a balletic “floral” choreography: they manipulate banners made of ultralight fabric that evoke colorful leaves, plants and flowers, creating huge volumes that flow and undulate gracefully in space. During the creative process, co-choreographers Tuan Le and Tan Loc spent a lot of time with the cast exploring the show’s physical and acrobatic vocabulary in order to help drive the emotional momentum of the narrative. Using the film AVATAR as a creative springboard, they drew inspiration from the energy of the Na’vi to spark the creativity of the cast. Their goal was always to create individual or ensemble movements that look and feel “authentic” in order to persuade the audience to suspend disbelief. • For the forest-dwelling Omaticaya, wood instruments, flutes and the everyday sounds of the village were used to create beats. • A female singer and a male percussionist perform live on stage along with the pre-recorded soundtrack that makes up the show’s soaring cinematic score. Tsurokx awnga fìtseng fìtxono.| We stop here for the night.